Comically charming and delightfully wry, “Ain’t it Awful” is a laugh out loud tour of all things unsatisfactory!! This lighthearted, tongue in cheek, look at everything that is wrong with the world is a must read for anyone who loves to laugh in the face of human foible! 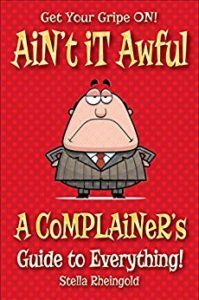 Learn all about how & why we complain, how to complain successfully and how to deal with other people’s incessant whining. Find new and fun things to complain about, and discover the joys of having a good hard moan yourself. After all, Comedy truly is the whiner’s art form! !